There are few things I love more than tacos or lamb, so you can imagine how I feel about putting the two together. My kids, and maybe a perfect day at the beach would top that list. After that it's definitely lamb tacos. 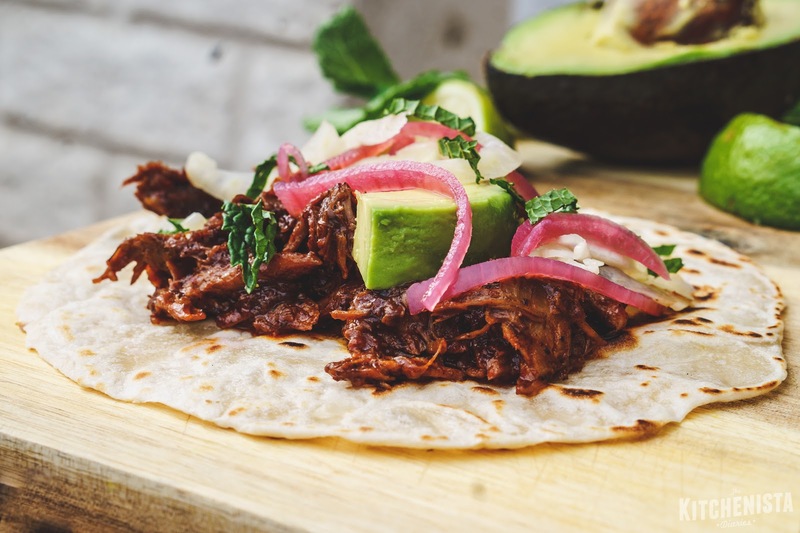 Specifically, fresh tortillas filled with hot shredded lamb tossed in a thick, luscious chile sauce and topped with pickled onions and fennel. And mint, and avocado. I pretty much covered all of my favorite things in one bite. But before I get ahead of myself, I have some news to share! For starters, February is Lamb Lovers Month! 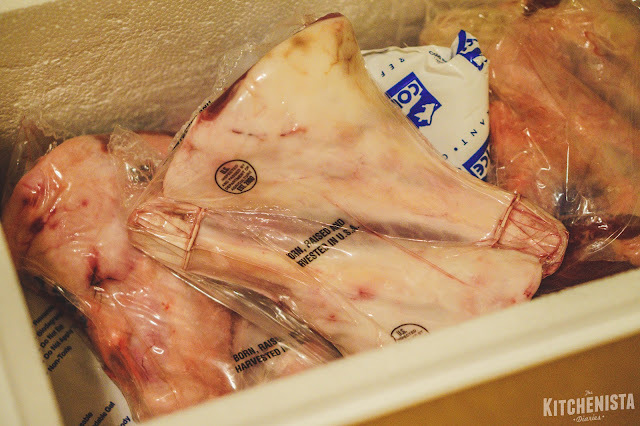 Now that's reason enough to be excited, but The American Lamb Board is upping the ante by giving away prizes every week this month. Head on over to take their quiz and find out your "Lamb Language of Love" to enter for your chance to win! 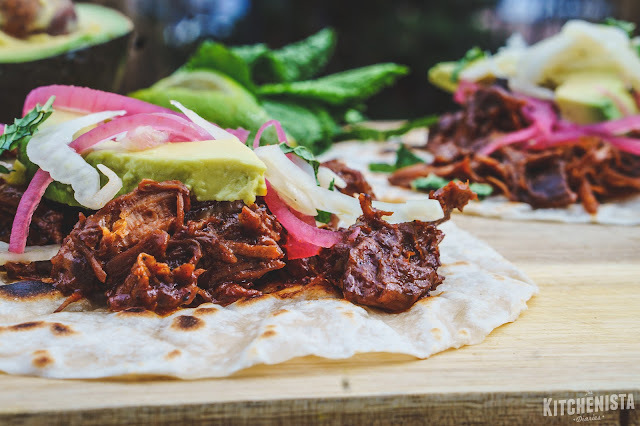 The first week's prize happens to be eight lamb shanks and a Dutch oven pot, which is precisely what you'll need to make these tacos. I can tell you from personal experience that those shanks are amazing, because they showed up at my doorstep this week. Which brings me to my other little bit of news: This year, I'll be working with the American Lamb Board as a "Lambassador!" 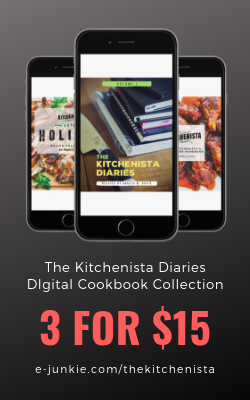 Look for fun recipes, cooking tips and the scoop on lamb-centric local events all throughout the year here at The Kitchenista Diaries and my social media feeds. I was beyond happy to get to work right away on my first post! I took the Lamb Lovers Libs quiz and found out that my Lamb Language of Love is "Looking for Love." (If by love, they mean tacos, I think that's correct.) 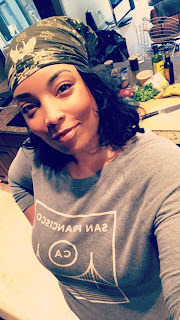 Truth be told, Valentine's Day isn't exactly high on my list as a single woman, but this year there shall be delicious lamb tacos, my single friends, and perhaps some champagne. 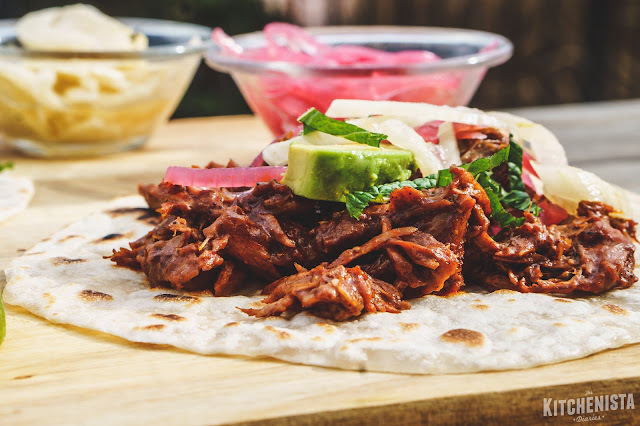 Look, you're not ever going to disappoint a group of friends by serving lamb tacos. 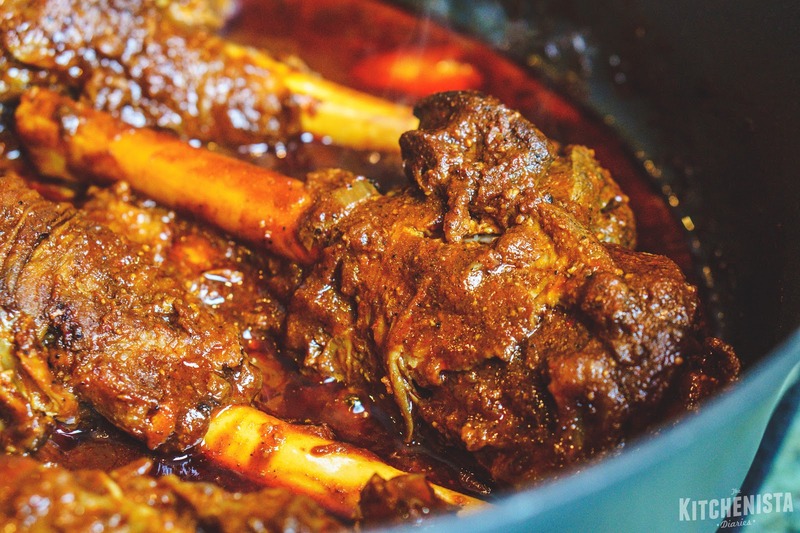 Even people who've never eaten lamb or may be hesitant to try it, will fall in love at first bite. The texture of braised lamb shank is like a cross between pulled pork and shredded beef, with a funkier, mildly gamey flavor. 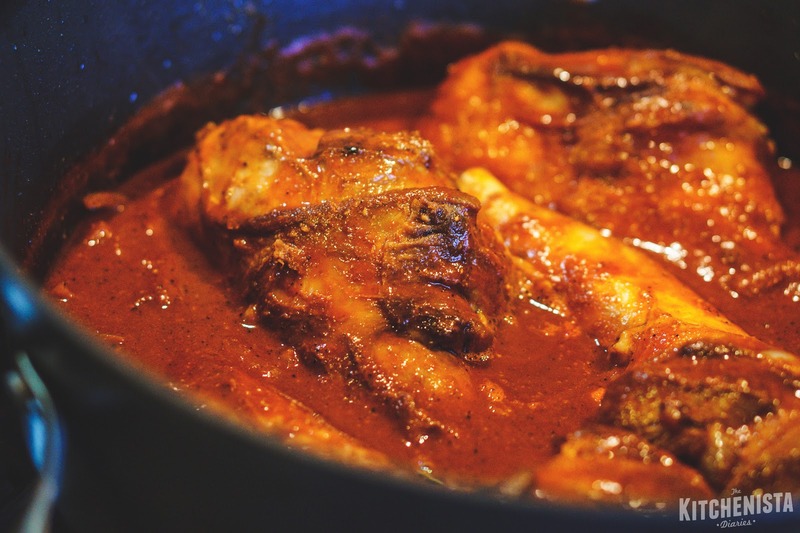 Because the meat cooks on the bone, you get the added benefit of a super rich sauce from all that collagen that melts off the lamb shanks during the braise. Typically you'll see lamb shanks served whole; one to each person makes for convenient portioning and stunning presentation. 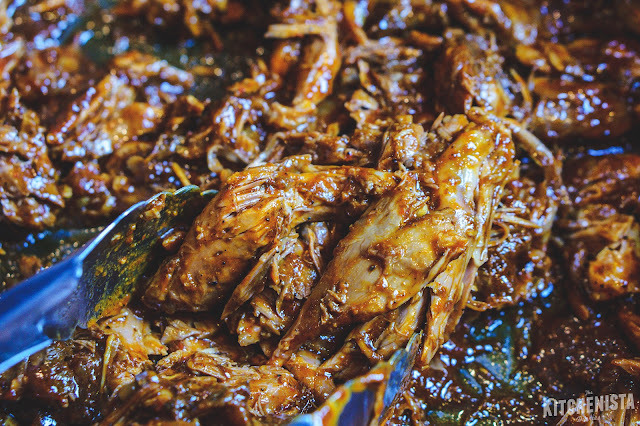 For this recipe, I pulled the meat off the bones once it was tender and then shredded it for my taco filling. 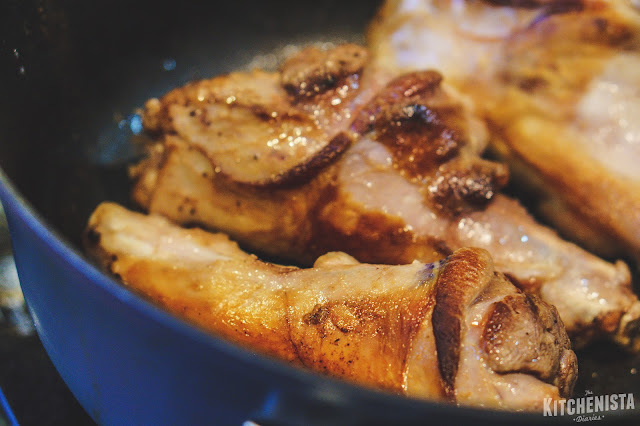 You could just as easily use large pieces of lamb shoulder instead if you can't get shanks. 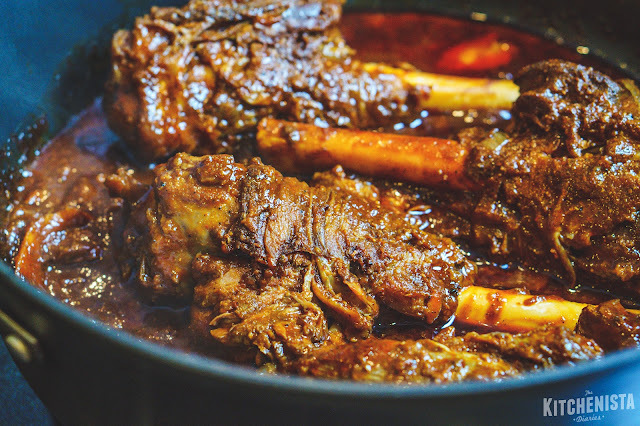 I often braise lamb shoulder chops for stews, but now that I've had the opportunity to compare the two I think lamb shanks have a slight edge on flavor and texture. Because I was serving tacos on a weeknight, I split the process into a couple days. 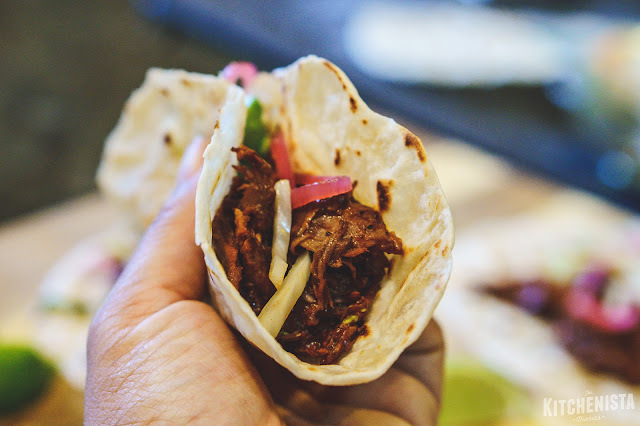 I braised the lamb first and chilled it overnight, then made fresh tortillas and assembled tacos on the second night. The meat and sauce reheat easily. Otherwise, it's a great weekend project if you have all day to fiddle with it. 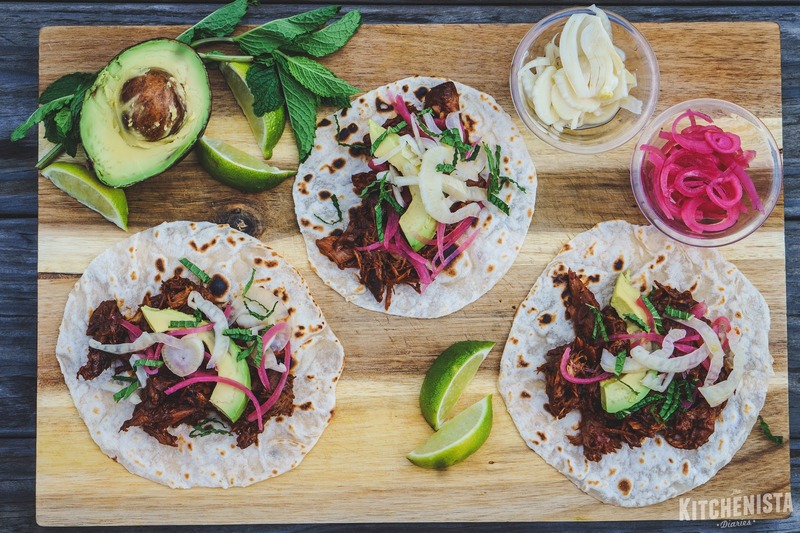 If you'd like to serve the tacos with pickled garnishes, and I suggest that you do, you can do those up to a week in advance and store in mason jars. Check out my previous post for a down and dirty guide to making a jar of quick pickled onions! If you've already made (or at least read) the previous post for Tex-Mex Chili, you'll find both the ingredients and process similar. Warm the Dutch oven pot over medium high heat, but don't add any oil yet. 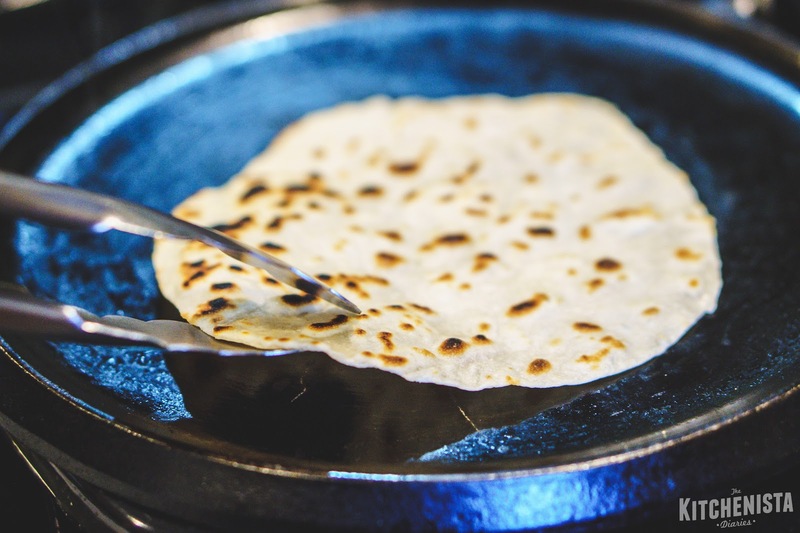 Start out by toasting both the chiles and whole spices (cumin, coriander and anise) for a couple minutes until fragrant, stirring frequently to prevent scorching. 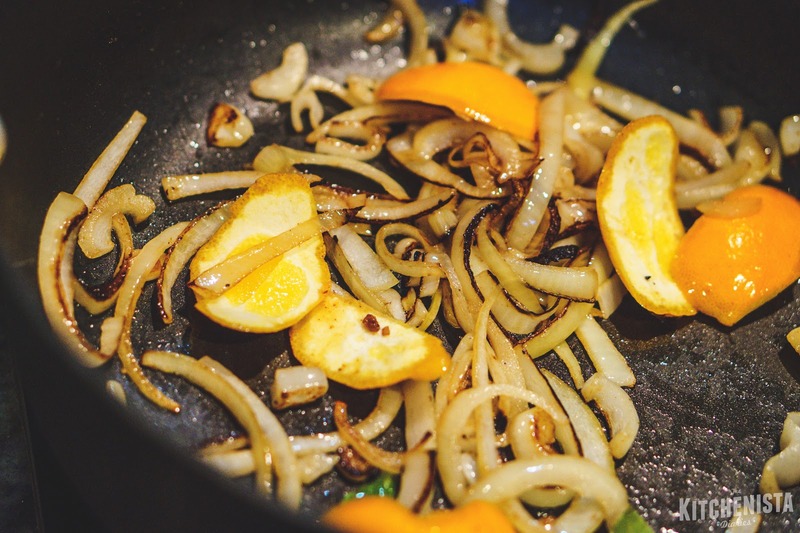 You can do this all in one step or toast the chiles and spices separately. 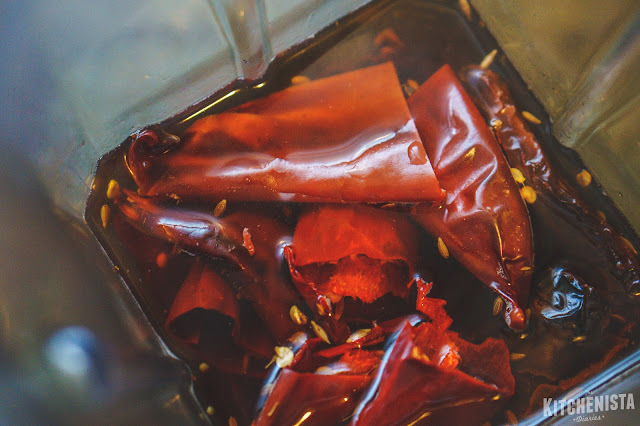 Add the toasted chiles and spices to a blender or food processor and cover with 2 cups of hot stock. Steep for fifteen minutes until the chiles have softened. 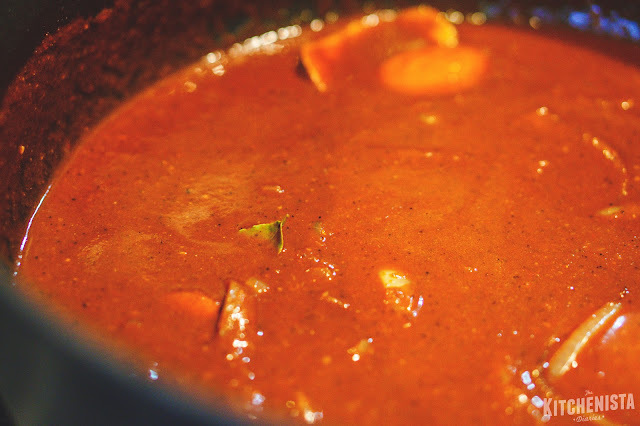 If you don't have a high powered blender, transfer the toasted cumin, coriander and anise to a spice grinder first, and then add the ground spices along with the other chile paste ingredients in the next step. 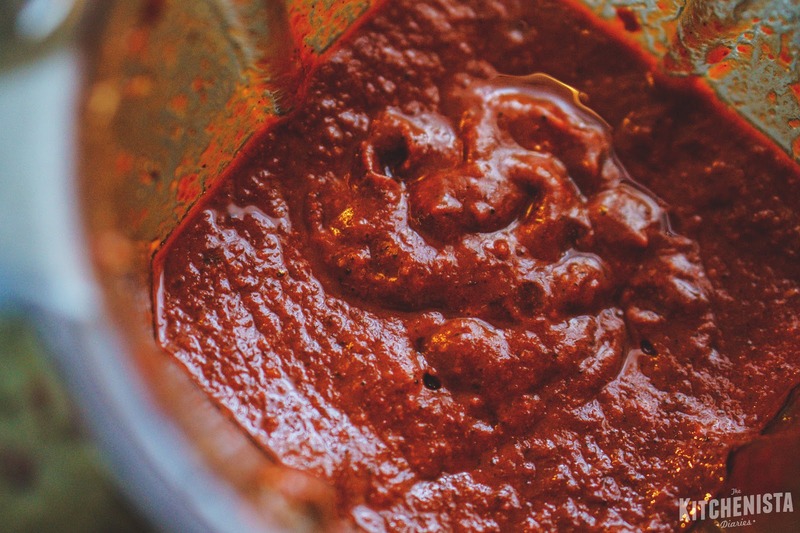 Once the chiles have softened, add the tomato paste, coffee, brown sugar, smoked paprika, black pepper, garlic cloves and oregano. Blend into a smooth puree. Season the lamb shanks generously with salt. Add a bit of oil to the pot, over high heat. Once just shy of smoking add the shanks and sear on all sides until golden brown and crusty. It may be hard to get a few spots that don't lie flat, but do the best you can. This should take about 15 minutes, working in batches if necessary if all of the shanks can't fit at once. 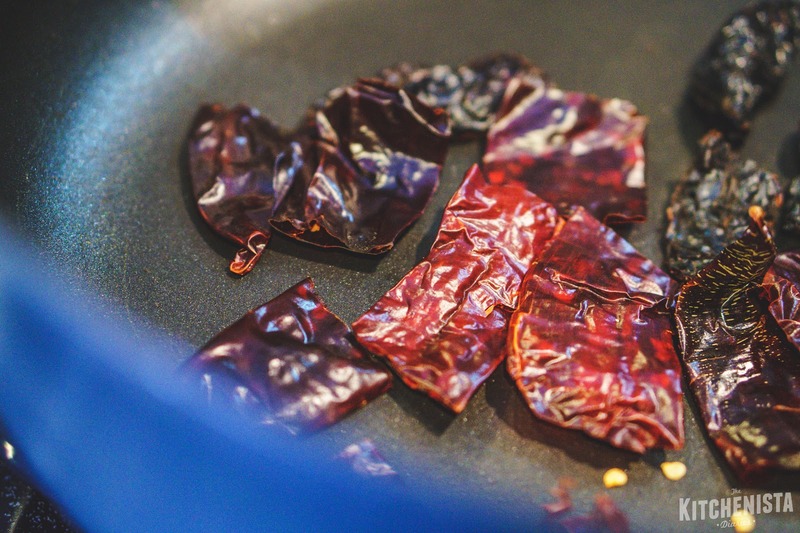 Preheat your oven to 325° F. Add the chile paste and remaining stock, along with the bay leaves. Season to taste with kosher salt. Bring the braising liquid to a boil, then return the lamb shanks to the pot. Toss them to coat well in the sauce. Now might be a fun time to tell you that these are fresh flour tortillas made with duck fat. When I get the recipe down I'll have to share this one. Tacos are my love language.